Still plot how God may die. I took an afternoon's break from Plenilune to scribble a brief bit of Gingerune that happened to come to me. You know how that goes. The blood shocked back to my heart and seemed to spin in it, fire-tinged; my splayed hands froze on the pages. Somehow, as though some familiar note called out from him to me, as though some familiar touch reached across the distance from him to my mind, I knew him. I had not imagined meeting him like this. I flung out my thoughts through the house but I knew I was alone. Maslin and Rowena would have no notion that the thing we had been looking for stood on our threshold, pinning me down with his awful eyes. It was a moment before I could turn and meet them. He looked younger and was far more handsome than I had imagined. Taller, too: the crest of his sheeny golden hair brushed the lintel of the door and his chin was bent a little downward as if, should he straighten, he would knock his skull against the beam. The blue of his eyes was like heaven—the irony burned in my mouth. They looked into me and knew me and called me by name, the name Maslin used; and for the first time in a long, long time, I tasted desperation. He smiled, and his smile was full of fangs. 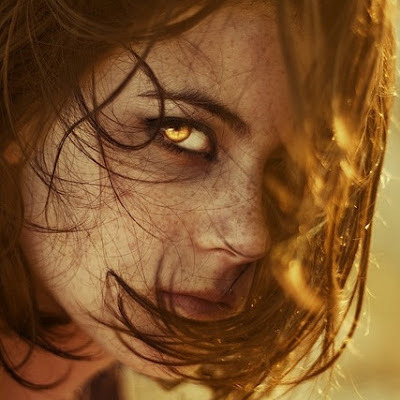 I do not know what made me do it, save that I hated that beautiful face and I hated those fangs and I hated the fire coursing through my own veins. I hated myself, and with an agonized cry I sprang forward, ducking and sweeping upward to take him under the ribs. But he was too fast. He gripped my fist in his hand and jerked me forward, out of balance, snatching my other hand so that we stood, fingers locked, feet planted in the worn floorboards, eye to eye. I found that I was terrified, trembling with terror—and he knew it: I saw in those beautiful eyes that seemed to pull me into their rich, icy depths, I saw that he knew how afraid I was. “Why did you do it?” I rasped. The balls of my feet gripped the floor and I pushed, but it was like pushing against a rock wall. He did not budge. I did not think he would really tell me. He could crush me under one clawed foot and crack my bones with fire and swallow me down into hell with one gulp. Who was I to face the Grimouder prince and demand an explanation from him? But the very cheek of it seemed to catch him off-guard and to almost amuse him. His fingers tightened on mine: the pain began to lance up my arms and send little lightning-flickers across my vision. He lowered his head, his forehead nearly touching mine. His voice was a whisper and smelled sweet in the air. He let go one hand and took hold of the fire of my hair in two fingers. It burned with the light that came in past him through the door, the red of it like defiance, the glow of it like hope. He smiled, but in his eyes as he watched his fingers work the heavy ginger strands there was something like caution. I had not expected him to answer me: it struck me that he had not expected me to defy him, he who was so beautiful, whom many who remembered thought of as a god, and he was testing the playing field. Wow...intense piece, Jenny! I take it this happens at the start of the book? Thank you for sharing and I look forward to seeing from where this will go :). Not in the least, Joy! You don't know how encouraging it is to hear all your comments. Well, perhaps you do because you have blogs of your own... But that's why I put things up here on The Penslayer, not because I find excessive coding and HTML wrangling particularly fun, but because I like your feedback. So thank you! I forget, sometimes, that you don't have the mangled scope of vision that I have for these three stories (Adamantine, Plenilune and Gingerune), and that you are missing bits and pieces of varying sizes, and that things won't always make sense to you as they might (MIGHT) make sense to me. After I posted this I thought, "Well, darn." But you seemed to have liked it anyway, despite enormous gaps of plot! Oh, my dears, how crazy this all is, hauling these stories out of my imagination, wandering through them, and making sure they fit together! Oh, I know Jenny! I find that even the "littlest" of comments encourage me on my blog :), and you don't know how ecstatic and excited I felt the other day when I got the sweetest of comments FROM YOU on my blog! It totally put a smile on my face for the rest of the day and warmed the cockles of my heart! I am glad that my little comments on The Penslayer (abet they be infrequent sometimes, or repetitive) are a little bit of an encouragement to you in your brilliant talent of writing! Ah, to be perfectly honest... I believe Adamantine, Plenilune and Gingerune remain as enigmas and riddles for us readers... fascinating, and evasive; because, once I put your stories in "this box" (like.. "ah, it must be a fantasy!" or "ah, it must be a legend, myth sort of tale!" or "ah, its time-travel, Victorian" I get all muddled I give it up, and just enjoy the wonderful peeks you allow us of your three mysterious novels, which almost always take my breath away by the beauty of the writings, the emotions etc, and cause me to truly wonder what they are really all about!! This is something that confuses me as well... Its nice to share snippets of my stories on my blog that pique at least a slight interest from my readers, but I generally get so scared to "Give it away" sort of thing, and realize that most times what I share doesn't make a whole heap of sense because sometimes it gets muddled in my head too and makes little sense to me, let alone others. (i.e. I state one thing about my character on my blog, but a few days later realize something I never knew and see that what I've previously written was all rubbish!) Ah, but that's a writer's life, isn't it!